The historical country estate Lindenhof (840 m above sea level) is located in the middle of the Austrian central Alps in the hiking/skiing /world championship region of Murau with it's beautiful Murtal valley & it is only a 7 minute walk from the medieval city of Murau. Go on vacation without giving up living comfort under old linden trees in the 7700 m2 park area surrounded by mountain forests & meadows. View of the city castle & the burg ruins and the surrounding mountain world, very beautiful guest house, nature swimming pool with restaurant, large sun lawn, patios, grill, table tennis, beach ball, infra-red sauna, massage, restaurants & cafes in the city, all shopping facilities, hiking/biking paths about 340 km directly by the house, only 1 min drive to tennis, fitness, indoor pool & only a 4 min drive to golf, rafting, horseback riding, steam engine rides, 15 min drive to summer toboggan run, countless attractions and hiking destinations. 45 minute drive to thermal springs. The Lindenhof, submontane to the Frauenalpe. Amidst the idyllic landscape, submontane the Frauenalpe, only few minutes on foot to the medieval village of Murau the historic country estate Lindenhof is located. It is named after its almost 200 years old basswood trees. It was once the hunting and summer residence of the famous railway pioneer Carl Wumb (1850– 1907) who next to other big projects like the Alpine North-South-transit, also built the Murtal-railway. Romantic train journeys with the old steam train are still offered today. Well equipped, we invite you! After extensive interior and exterior renovations of the historic Lindenhof, we can offer five stylished and very comfortable apartments (for 2 - 6 persons) for vacations without compromises. The exterior, historical appearance has been maintained. The very comfortable, bright apartments are equipped in modern standard and with a lot of love. The beamed ceilings and new wooden floors create a cosy ambience. The bathroom of about 10 m² is furnished with a bathtub, bidet, toilet, vanity unit with integrated mirror. It is spacious and contains underfloor heating. Our guest house offers 5 very nice and comfortable apartments from 60 to 80 m². The apartments have been equipped with a lot of attention paid to detail, partially with antiques. In accordance with tradition, a lot of wood was used for design and furniture. Very good drinking water quality, modern technical standards, very beautiful, peaceful green location with direct access to the park, natural swimming pool with a small restaurant only 50 m. 4 bikes can be rented for a rental fee. Nestled between the Nock Mountains and the Low Tauern Mountains, far from the industry the picturesque Murtal Valley is a paradise for hikers & skiers. Rightfully, the Murtal Valley with its city of Murau as the centre is described as one of the prettiest Alpine regions in Austria. Due to clear-sighted politics with sense for environmental consciousness & landscape protection, one of the biggest bio-regions in Europe has been created. 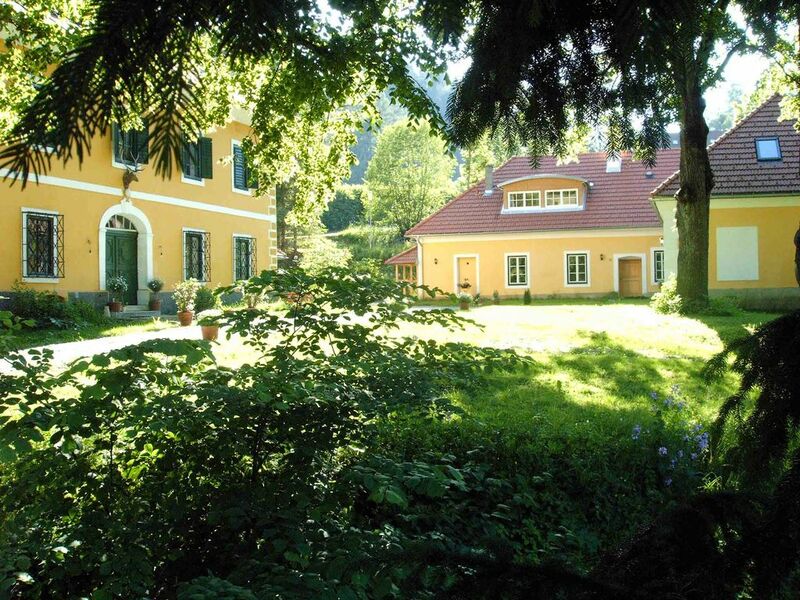 Surrounded by the green of the mountain forests & meadows and the best air of Austria, the holiday-maker can relax. On hikes through the densely wooded mountain world with peaks up to 2700m, you not only will experience pure nature but also refreshing stops in quaint Mountain huts with regional and biological delicatessen. The skiing & hiking region of Murau is always in season. You have the choice between 7 Murtal skiing mountains. The international skiing area Kreischberg is only 6 min drive away. Die Mietpreise für insgesamt 3 Wohnungen von 63 qm bis 80qm liegen zwischen 65,00 und 90,00 Euro/Tag/Wohnung, Beisspiel: Wohnung OR 65 qm, ein Doppelschlafzimmer, ein Doppelschlafplatz auf der Empore, ein breites Schlafsofa, Essecke mit 5 Sitzplätzen, gemütliche Sitzgruppe für 5 Personen, SAT-TV, Einbauküche mit 4-Plattenherd, Preis für 4 Pers. pro Nacht 65,00 Euro, alle Winter- und Sommerpreise enthalten bereits die Nebenkosten. Ortstaxe/ Nächtigungsabgabe 1,50 Euro/EW/Tag, Kinder bis 15 J. frei, Endreinigung, einmalig je nach Wohnung und Belegung 35,00 Euro, Haustiere frei, Zustellbett 10,00 Euro/Tag, Babybett kostenfrei, .